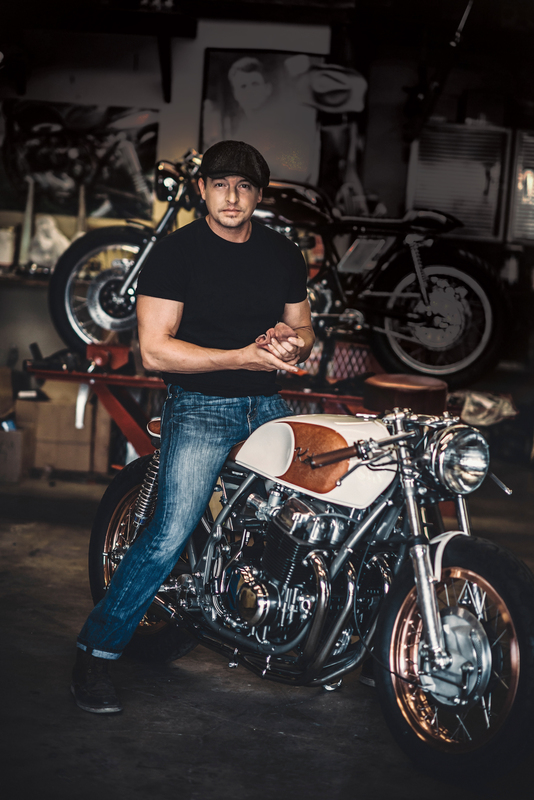 When Dustin Kott looks at a motorcycle, he sees past the sum of it parts to the history, the life, welded into it bones. He sees an opportunity for self-expression, a vehicle for freedom. 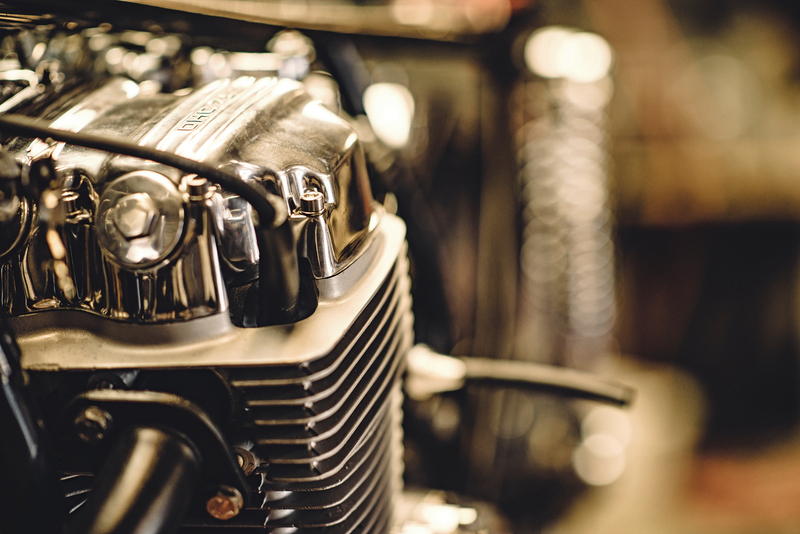 For a man who finds identity on the seat of a bike, a motorcycle is a chance to not only tell a story – but build one with his own two greasy hands. 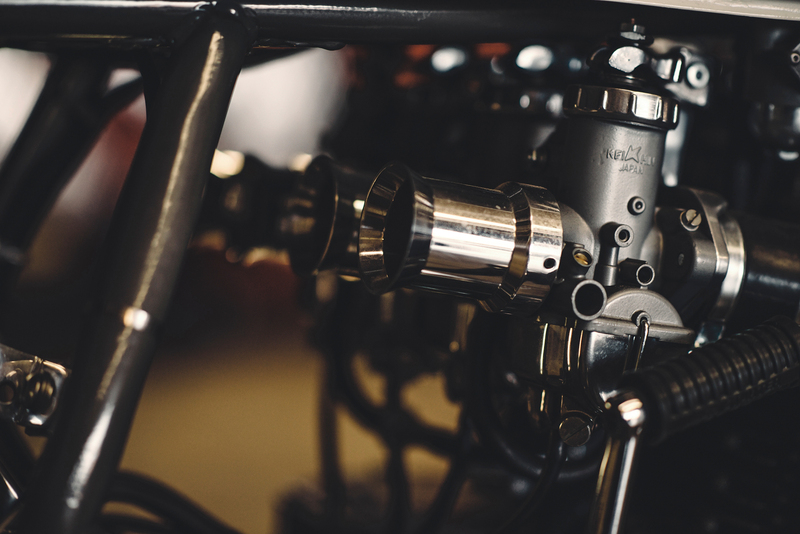 Seated in front of a bike in his shop, Dustin methodically put the finishing touches on a build as the bluegrass sounds of Chris Stapleton kept time. He grabbed a cloth rag from the back pocket of his faded Levi’s and wiped down the body of the bike. Wrenches and screws lay strewn on weathered tool benches around him, and a bike hung on chains from the ceiling. In front of him, a framed poster of James Dean quoted the actor’s propensity for living in the present moment, as subtle remnants of the past smattered the other walls and surfaces of the shop. A ragtag batch of forgotten, discarded bikes stood in a line in front of the open garage door. Reflecting the sharp summer sun, even the bikes seemed to lament in the heat. He never thought he’d be here, but now that he was, there were few reasons in the world worth losing that dusty old shop. 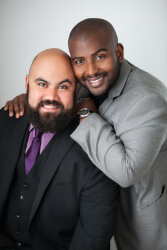 Dustin had found his purpose – and the world agreed. Dustin got his first dirt bike when he was 12 years old, and he took it to the highway just as soon as he could get away with it. Nothing compared, however, to the first time he rode a bike he built himself. Despite his innate, undeniable passion, Dustin took his sweet time coming to the realization that this was his life’s calling. 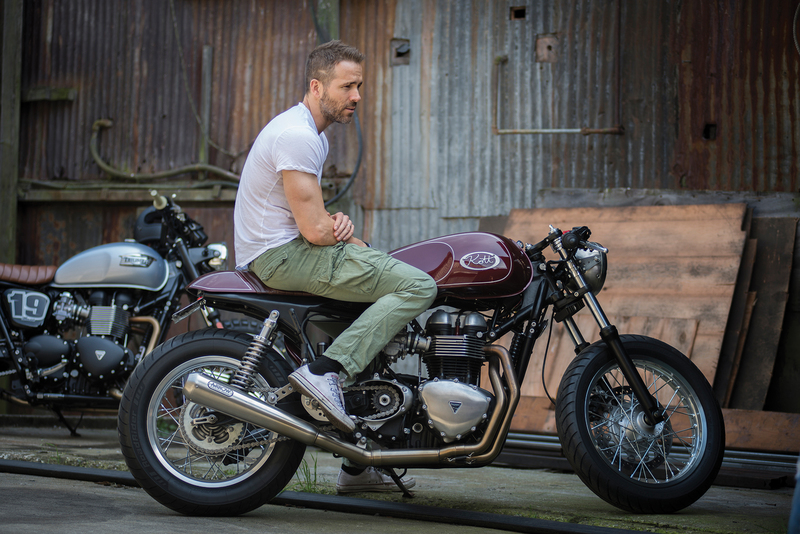 For Dustin, the motorcycle is an extension of his identity, a way to express what he values without using words. 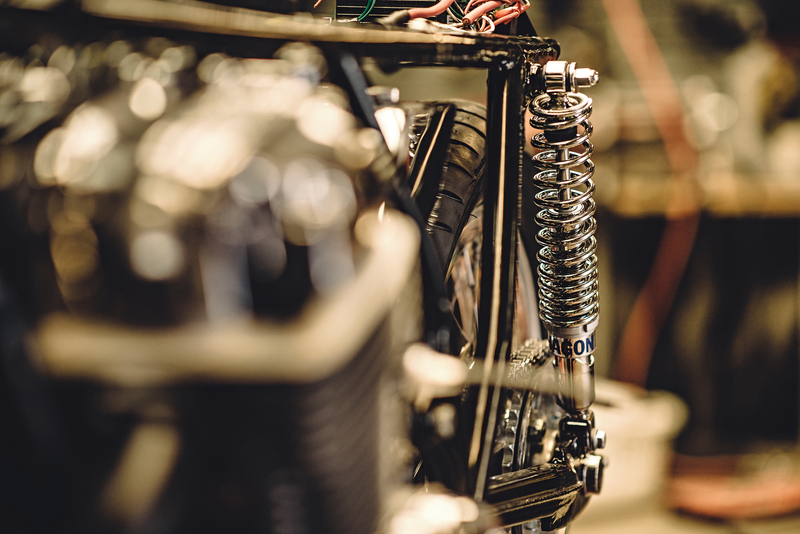 His bikes are tenderly handcrafted, steeped in history and built from a pile of parts and scraps that would have meant nothing without the mind and passion of an engineer. And when it finally comes time for that first ride, his bikes take that story out on the open road. From live action video to website to marketing and promotion, friends helped Dustin move from hobbyist to businessman, a cap he is still extremely uncomfortable wearing. 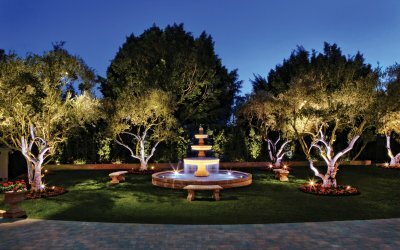 Overnight, his first promotional video attracted more than 250,000 views, and the phones got busier. 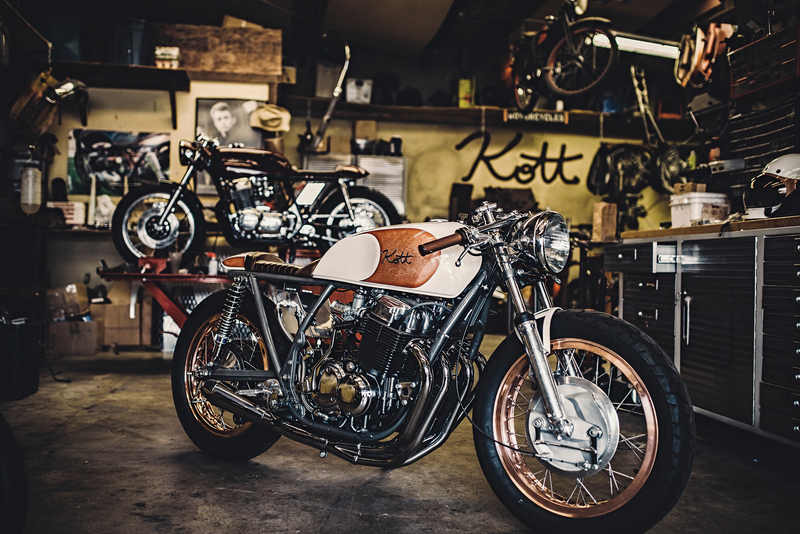 Demand led to work, and Kott Motorcycles was officially launched in 2009. Today, Dustin can barely keep up with the interest individuals and the industry express in his work. 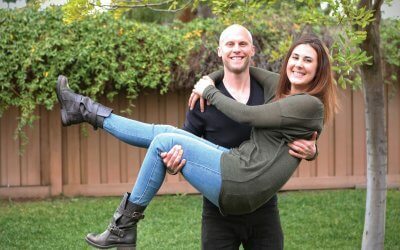 “It finally became a way to carve out a living for myself,” he said. Dustin had unintentionally discovered a market that was looking for originality, authenticity and that seductive feeling of eras past. 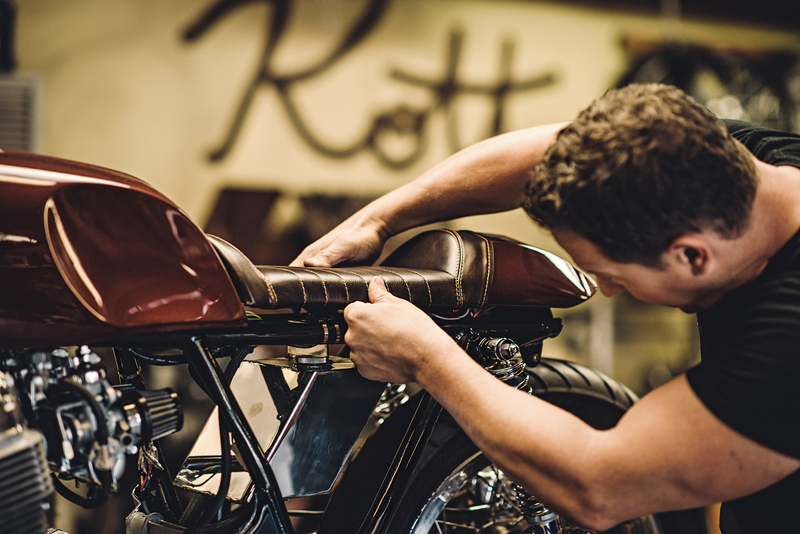 Half restoration, half creation, Kott Motorcycles are sourced from the ever-popular vintage 70s Café Racer. 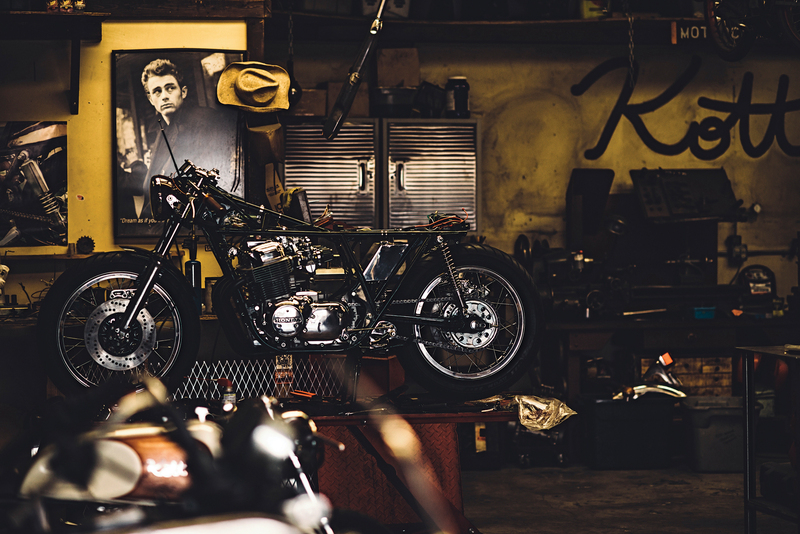 Because those bikes are no longer factory supported, Dustin makes a lot of the parts from hand, using other discarded parts or reshaped scrap metal, custom fitted to match the bike. “No two are alike,” he said. Once an order comes in, Dustin begins by surveying the bike, finding inspiration and sketching a design. 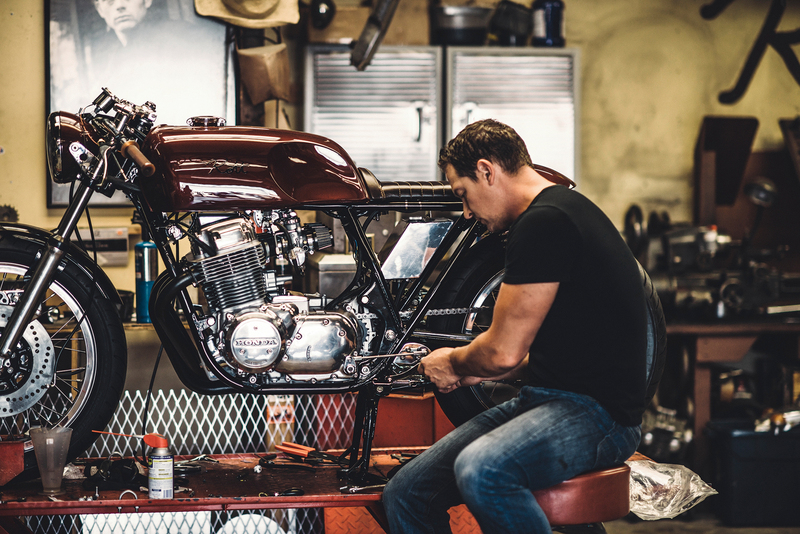 When he’s satisfied, he starts the build – frame first, motor last. 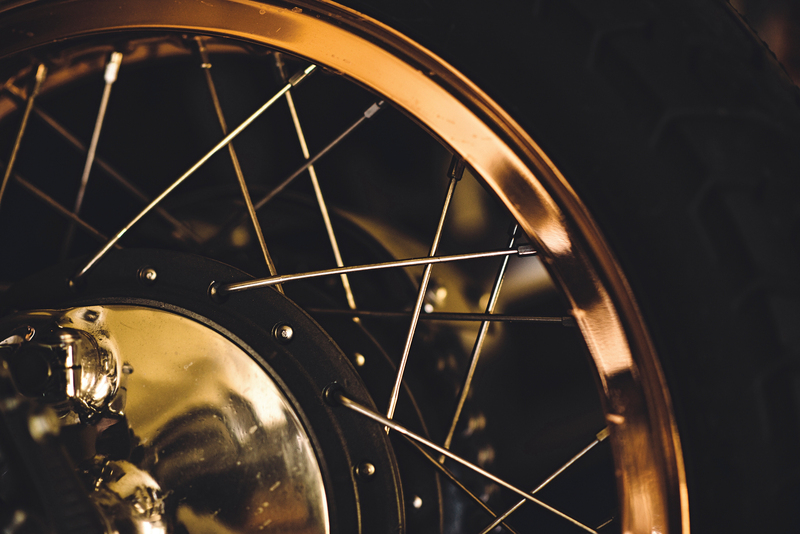 Providing the bike with more than a makeover, he improves the functionality of the bike and fits it to the rider, adjusting for height and weight. 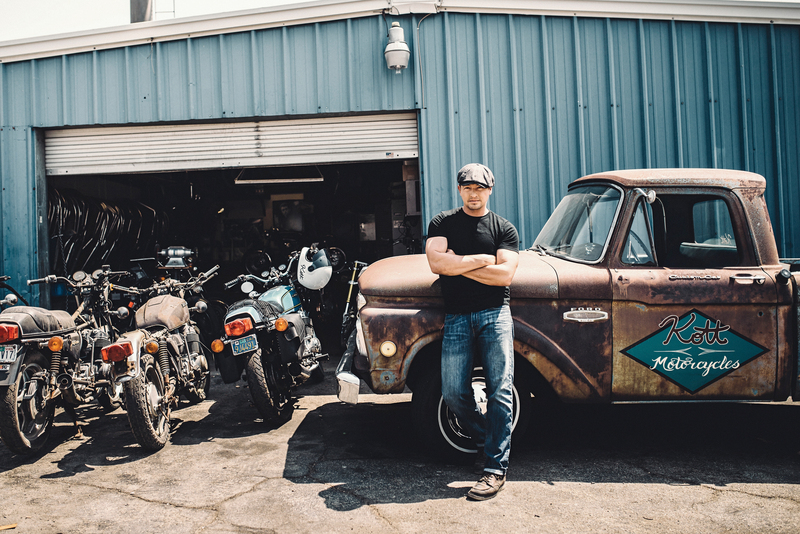 Each bike takes about six months on average to build, and Dustin turns out about 10 to 12 bikes per year. The hours are demanding; the labor is a grind. But to Dustin every bit of work, sweat and frustration is worth it if it means protecting the integrity of his brand. It’s a fear he has to consider as his business threatens to grow past him. Dustin paused to rub his grease-stained knuckles. Surrounded by weathered machinery, scraps of metal and creative opportunity, Dustin was in his element. He needed nothing more than an old AC unit and vintage Honda CB. 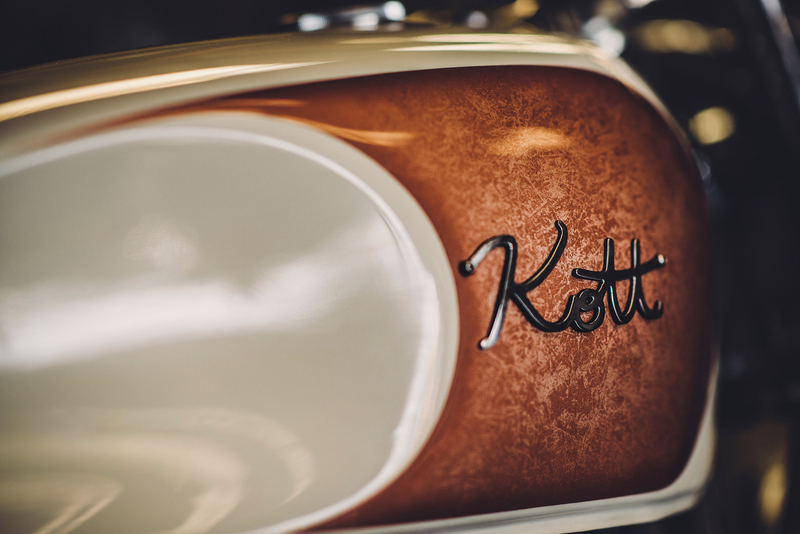 For more information, please visit www.kottmotorcycles.com.